Rae Hoekstra has loved to sew ever since her mom taught her when she was young. 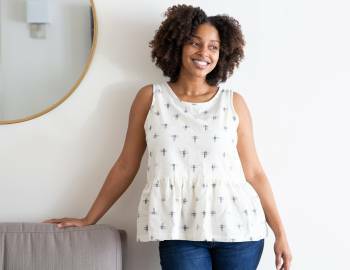 She began her sewing blog, Made by Rae, shortly after leaving her job as a high school physics teacher to stay home with her first child. 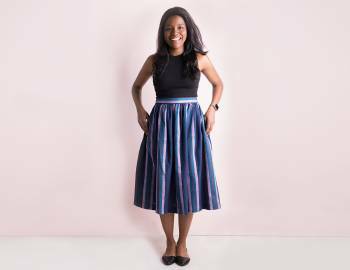 Her website is now a popular spot for DIY and sewing tutorials and has a large and enthusiastic audience. 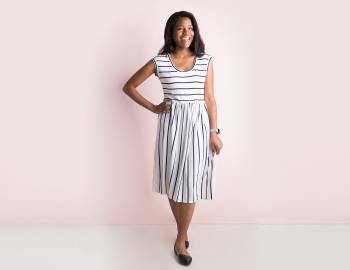 Rae spends her work time sewing, blogging, and designing sewing patterns for the home sewist. She has also designed four fabric lines for Cloud9 Fabrics. 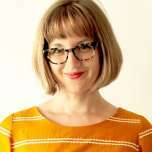 Her sewing patterns include the Parsley Pant, Charlie Tunic, Flashback Tee, and Geranium Dress sewing patterns for children and Beatrix, Ruby, Bianca, Luna Pants, and the wildly popular Washi Dress for women. She also has an extensive collection of free online sewing tutorials and patterns on her blog. Rae has hosted a number of popular online sew-alongs and events on her website, including the Spring Top Sewalongs, KNITerviews (tips and interviews with fellow bloggers about sewing with knit fabric), and Celebrate the BOY. She hosts local Sew Ann Arbor sewing nights and teaches the occasional sewing class at her studio in downtown Ann Arbor. Rae lives in Ann Arbor, Michigan, with her husband and three children.